The trio are all set to start their planned road trip with nervousness and excitement. As the story spins, giving you information about the beautiful destinations across India, it also throws light on the past of each individual's life. The childhood memories are not worth remembering if they had brought loneliness and darkness in life. Life is not smooth always and one always feels the other side of the grass is green. At the same time, changing your views, giving new perspective and thought to life and trying to make your present happy is what the book tells you about apart from Indian destinations and its facts. The friendship that Abhay and Sasha share throughout the book would definitely remind you about the close/best friend in your life. The charming girl is Unnati in the story with her sweet voice, who seeks attention from the one she loves. All said, what can happen on a road-trip,be it fun or the hardships one has to face, fighting the right and wrong emotions; will they ever be able to complete this road trip with the movie ? I would definitely leave it to the readers to find out more. There are lot of incidents narrated in the story which one comes across in their daily life and this is one such book that has given me a connect with the story. Simple Language and effective emotions add grip to this story. 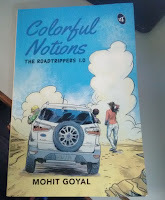 The supporting characters be it moms' , mamaji, and various other characters involved in the road trip have done fair justice in the story. Viewing India on a RoadTrip is tough but the book has given an experience of East, West North & South in a beautiful way. Love, Guilt, Solving the Complicated Mom-Son relationships, Friendship, Road Trips, food-love, following your dreams, Spirituality are the key elements of this book giving you the connect and ensuring you get immersed in the story . Recommended to those who love travelling, like reading about love, relationships and definitely someone having an impulse or dreaming about the ROAD TRIP. 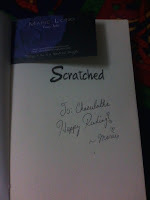 The book "Scratched" has been reviewed as a part of tour schedule of Njkinny Tours & Promotions. Thank you Marie for signing the book :) !!! The first book "Scarred", in the series portrays the story of one of the three Anderson brothers Dominick. The second book namely Scratched is about Kevin and the next book Scorned is about Michael; yet to be released. Scratched as the title of the book; reflects the the story too. The haunting past, struggling present, complicated relationships, love, emotions are few of the various sweet and spicy elements the story is built upon. Kevin and Dom have had a shady childhood life and yet had overcome the struggles the life gifted them. Apart from finding happiness in making people's feet tap with his DJ; Kevin also finds happiness with Trinity around. The book "The THC" had been received from The Tales Pensieve for its review. The book is all about the dynamic states of today's relationship. How love changes with time, consistency in the loyalty of relationships, guilt, loss of loved ones, the unheard feelings of a man/father/son and the adulteration in today's relationships. The story revolves around the three main characters Samar, Sanjaneka and Varun. Three different people, three different stories and all are at one place the THC. The book is a journey on the lives of three people; how they explore and face their problems and what brings them all to the THC. Co-incidences do happen and one can find it in their stories too. But the soothing feel that you get when you pour out your past, your problems and the result is the strength you get to face it is well explained.